Wayne Mansfield: Holiday Inn Prove all hotels are bastards! Holiday Inn Prove all hotels are bastards! I have been had a couple of times after giving my credit card details to hotels... so much so I cause scenes at reception when they take my card away to record details. In a weak moment [ totally my fault ] I gave my card to the function staff at the Holiday Inn Perth to pay for a function [ March 2018 ] - she said I need to run this on functions machine I will be back... and 3 minutes later I got my card back and the receipt. Early May 2018 a charge appeared on my card for my April event which I had a Invoice for - I got really angry spoke to the manager and he said they would reverse it but as I owed the money I said keep the $$$'s but confirm you have destroyed the card details so it can't happen again... I duly got the email saying "Details destroyed and removed from our system "
I had a function there on May 13th and yesterday I got an email saying the $500 was due would I please pay by end of month [ today ] and then on my Bank statement appeared the amount as a "Pre- Authorisation" against the card they "didn't have details for"
So, you have been warned... doesn't matter which hotel you deal with DON'T let you card out of your sight. And demand they destroy details as you watch. 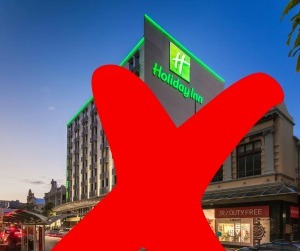 Holiday Inn offer great service [ that's why I have used them ] but staff are treated like slaves so they mistreat the customers!